and toasted almonds. 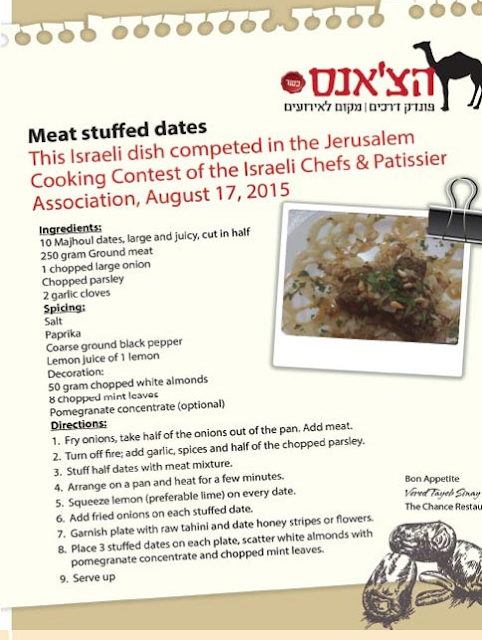 A creative Israeli recipe! On our recent trip to Israel, we ate lunch one day near the Dead Sea at a restaurant called "The Last Chance." 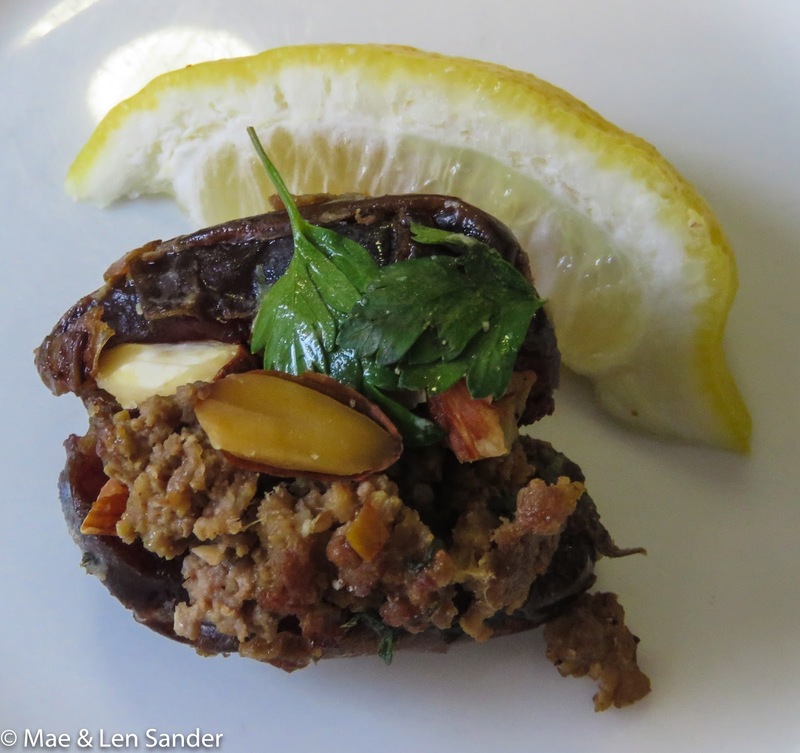 I ordered a very delicious dish which the menu called "Dates stuffed with meat, tahini, and silan." There was just a hint of tahini, and the ground meat spicing seemed vaguely North African (the restaurant's chef is of Tunisian background). Silan is honey made from dates -- in fact that's the honey that's meant in the Biblical verse about a land of "milk and honey." 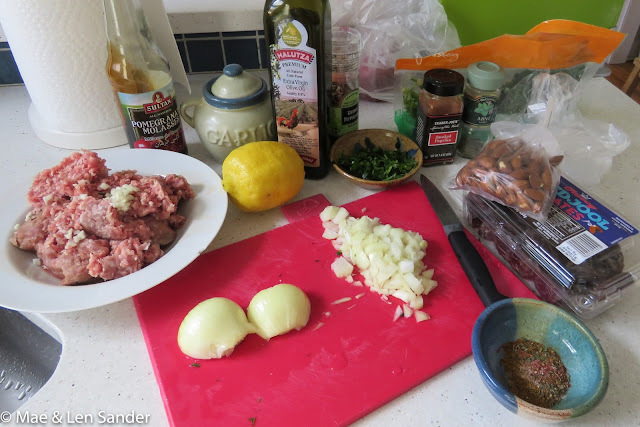 When I got home, I searched and searched for a recipe for dates stuffed with meat, but found that dates are sometimes used to stuff lamb roasts; they are often stuffed with cheese or nuts; but the recipe I wanted just didn't show up in any of my cookbooks or web browsings. Finally, in a not-so-obvious page on the restaurant's website I found their actual recipe! Stuffed date recipe from the restaurant website (link). I did not make an attempt to buy Silan, as it's hard to find. In any case, I thought it was a little too sweet for the meat dish as served in the restaurant. Using pomegranate molasses for garnish was enough sweetener. Besides the spices called for in the recipe, I added a little of the Moroccan seasoning blend Ras el Hanout because I thought I had tasted some of those flavors. 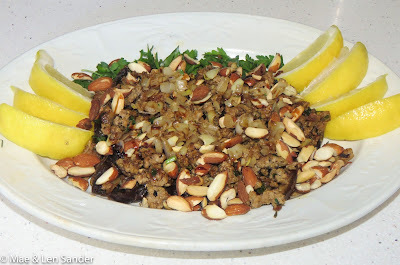 I used ground lamb from a local farm, but this would also work with ground beef. Ingredients ready to prepare, cook, and assemble. 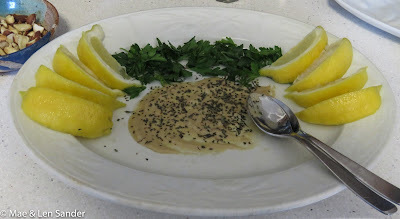 really not in season here so I sprinkled some dried mint on the tahini. I made sure each date was set on the tahini. Platter with the stuffed dates and recommended garnishes. This sounds good, Mae, and I love your presentation! I like the sound of this one. It’s nice to recreate recipes from a trip, thinking of the good time you had when visiting Israel. The only time I have stuffed dates was for an appetizer, stuffing a date with a basil leaf, goat cheese a d wrapping with bacon. if you are interested here is the link below. I love hearing about your trips. Good detective work! Looks like your dish was a success. Nice that you eventually found the recipe. Looks yummy, though I'd substitute ground beef since I don't care for lamb. Looks and sounds good but I don't know if I'd lamb since I've never tried it. Oh I do want to try that recipe - it sounds so yummy, and I do love lamb. Good job on recreating. Meal Kits? Not for me, thanks.